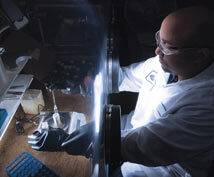 The ability to generate like concentrations, volumes and reactions is beneficial to most researchers. While FSSI can weigh to milligram, gram and multi-gram quantities, most of our clients request micromolar amounts. We have custom designed glove boxes for inert weighing and use complex software systems to ensure accuracy. Our technicians are able to weigh out the requested quantity accurately and within the specified range. Source and destination container barcodes are also scanned and captured.